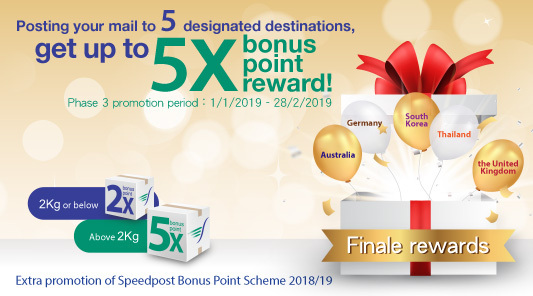 Speedpost Bonus Point Scheme 2018/19 is rolled out now! From 1 April 2018 to 27 March 2019, you can earn one bonus point for every dollar you spend with your Speedpost Account. Earned bonus points can be used to redeem a range of splendid gifts from shopping or dining vouchers to the new gift items such as 360° cameras and microwave ovens anytime during the gift redemption period. Act now! Take your favourite gifts home. By accumulating 8,000 or more bonus points from 1 April 2018 to 30 September 2018, you can earn an additional dinning or shopping voucher with a value up to HKD$100. *Calculation based on all sources of accumulated points from 1 April 2018 to 30 September 2018, the vouchers will be sent to eligible account customers by mail in about 2 months after the end of the promotion period. By accumulating 20,000 or more bonus point from 1 April 2018 to 27 Mar 2019, you can earn extra points according to the below ratio** at the end of the 2018/19 Bonus Point Scheme to redeem abundant gifts. **Calculation based on all sources of accumulated points from 1 April 2018 to 27 March 2019. Post to 5 designated destinations and earn up to 5X bonus points reward! Customers can sign in "My Speedpost" online platform and submit the gift redemption application. Fax or post of application form is not necessary. ++Gifts are redeemed on a while-stocks-last basis.In the event that a gift is out of stock, Hongkong Post may at its sole discretion provide a gift of equivalent value or with similar functions from the same gift category. > "Forms" > "Gift Redemption Form of Speedpost Bonus Point Scheme".